A New Map of Gallia Cisalpina and Graecia Magna Shewing their Chief Divisions, Peoples, Cities, Towns etc. This is a charming 1712 map of the northern Italy and southern Italy in antiquity by Edward Wells of Oxford. 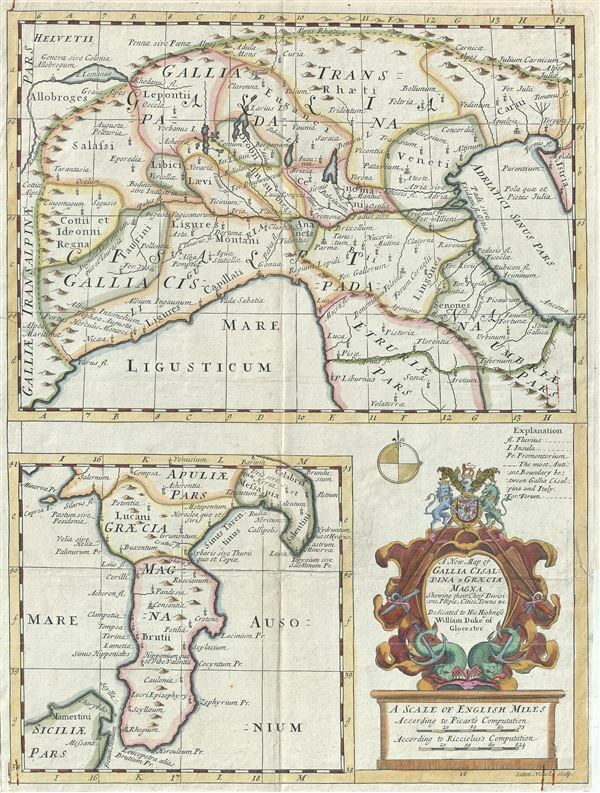 Essentially two maps on a single sheet, the top map depicts the northern part of Italy from Lake Geneva (Lake Lemanus) to Volterra (Volaterrae). The lower map covers the southern part of Italy from Salerno (Salernum) to Reggio (Rhegum) and includes the northeastern part of the Island of Sicily. Both maps identify important cities and towns and uses ancient names throughout. The Roman districts of Umbriae, Veneti, Etruriae, Carni, Gallia, Cisalpina, Liguria, etc. on the upper map and Siciliae, Brutii, Apuliae, Graecia, etc. in the lower map are also noted. During the first centuries of Imperial Rome, Italia was the territory of the city of Rome rather than a province, and enjoyed a special status such that the armies of military commanders were not allowed into the region. A decorative cartouche appears on the top left quadrant of the map featuring the coat of arms of the Duke of Gloucester. This, like many other Wells maps, is dedicated to Prince William, Duke of Gloucester and son of Queen Anne, who, when this map was being prepared, was a student at Oxford. Engraved by Sutton Nicholls and published by T. Bonwicke for the 1712 edition of Edward Wells' Atlas, A New Sett of Maps both of Ancient and Present Geography. Very good. Original platemark visible. Some wear and creasing along original fold lines. Narrow margins. Corners show rusted paper clip stains.